IN HER FIRST YA novel, Archibald Lampman Award–winning poet Nina Berkhout builds on the promise of her adult fiction debut, The Gallery of Lost Species, trimming away the extraneous language in that novel to deliver fresh prose tinged with evocative poetry. Her main characters are fully formed and – while not necessarily unpredictable – at least interesting in their choices and intricacies. Eighteen-year-old Twyla Jane Lee is an aspiring photographer trapped in the small community of Halo, Montana. Twyla and her boyfriend, Billy, plan to take off for California after high school and set up a catering business. But first she has to get through the 40 hours of community service mandatory for graduation – that’s where Gabriel Finch comes in. Barely older than Twyla, Gabriel is a former high school hero who joined the military shortly after graduation, following the death of his kid sister from leukemia. Their paths converge when Twyla is assigned to help Gabriel, who is suffering from the mental and physical aftereffects of two tours as a Marine in the Middle East. His parents have decided to move to Peru to work on an alpaca ranch and Gabriel refuses to accompany them. It’s never really made clear what Twyla (and Billy, who insists on tagging along, at least at first) is supposed to be doing to help Gabriel, other than making sure the fridge is stocked, the dishes are done, and the bills are paid, but the vagueness surrounding these details becomes less important as the story develops. 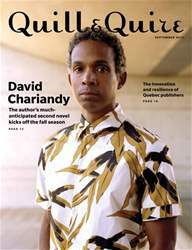 David Chariandy: The author's much- anticipated second novel kicks off the fall season; The innovation and resilience of Quebec publishers.